Hot on the heels of winning a major contract with Sunrise Senior Living/Gracewell, Duplex’s esteemed dealer Wightman and Parrish, pictured here with Barry Wilmot keep the Duplex flames burning at another busy Social Care Showcase at Brighton Race course. Many of the 200 delegates who attended were dazzled by Barry “dancing with Duplex”. 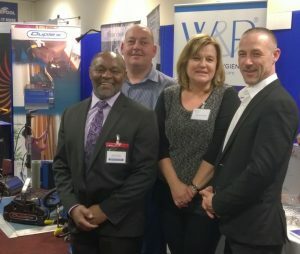 Barry commented “Many demonstrations were booked with our Duplex Steam floor cleaning machine. It was clear from this showcase that discerning customers are continuing to re-evaluate best practise measures in their care environments and the need to enhance cleaning regimes”.